Hollybeary Creations : 'Tis the Season.. a walk in the Park! 'Tis the Season.. a walk in the Park! Happy Thursday!!! It's time for a new challenge at 'Tis the Season... it's an Inspiration Bi-week. When I first looked at this photo it reminded me of a walk in a city park. So I went with that and created a little scene using the Lawn Fawn set Winter in the Park. I created the scene stamping in Black ink and then I punched it out with the 2 1/2" circle punch. 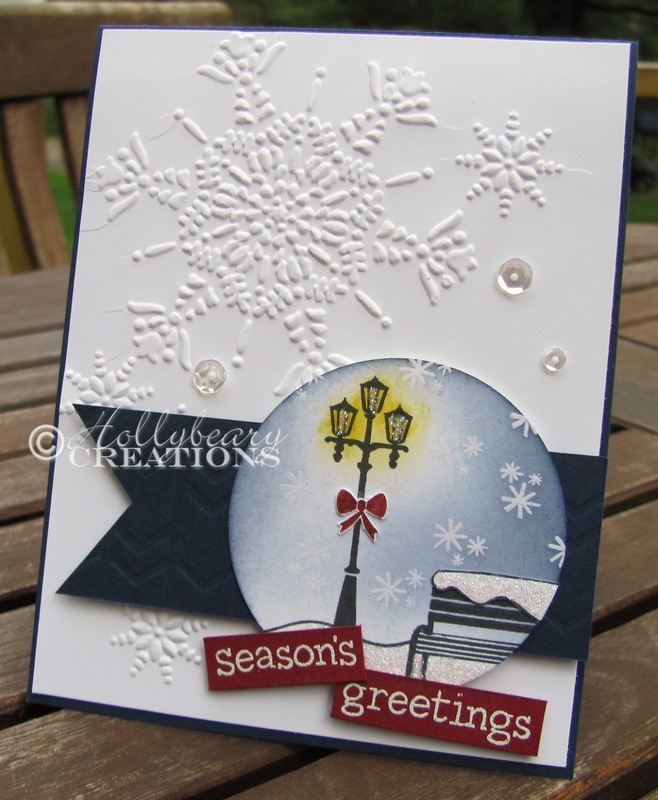 Then I stamped the snowflakes in VersaMark ink and embossed them with clear powder. Then I sponged in some Night of Navy & Daffodil Delight ink. I stamped the bow in Cherry Cobbler onto a scrap piece of white and cut it out. I stamped the snow for the bench on a piece of scrap as well and cut it out and added Dazzling Diamonds glitter to that as well as the lamp and the snow on the ground. I created a Night of Navy card base and then I added a layer of Whisper White that I embossed with the Northern Flurry Textured Impressions folder and the Big Shot. I also embossed a pice of Night of Navy using the Arrows Textured Impressions folder. Once the circle piece was in place I stamped the greeting onto a piece of Cherry Cobbler and embossed it in White and then cut it out and added it to the lower bottom. For some extra bling I added a few clear sequins from Pretty Pink Posh. 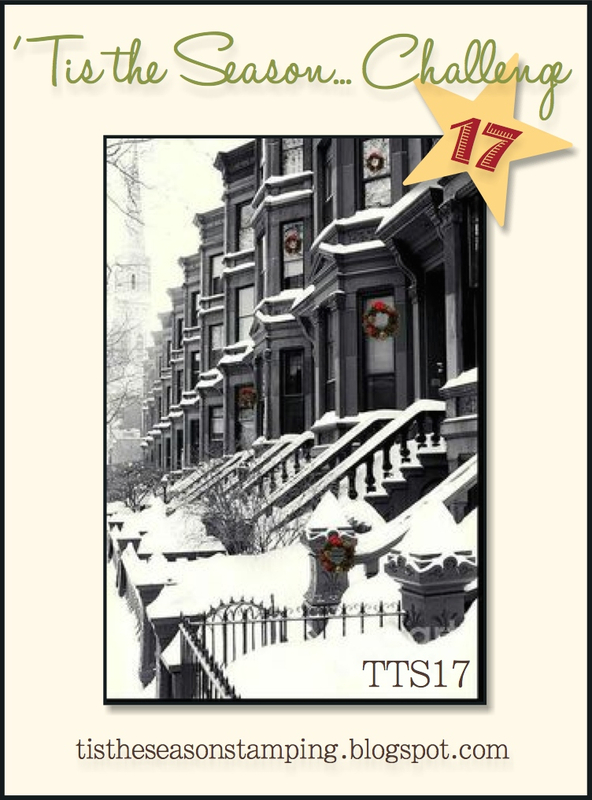 Be sure to head over to the 'Tis the Season blog and see what the other Design Team members created this week.. We hope you'll join us, it's a great time to get started on your Christmas cards. ** All products by Stampin' Up! unless noted. Wow! Love this , Holly! What a fabulous card and what a perfect take on the photo. I love the embossed snowflake and your inking of the "scene."